Compact "De Luxe“ rucksack with a capacity of about 30 liters. We equipped this rucksack with an extremely comfortable carrying system and a padded, breathable back part, because primarily during spin fishing, you need to carry the rucksack over a long time. Efficient and secure rod holders are located on each side, and a big zipper pocket is settled at the front. The lid is designed completely overlapping to improve splash water protection. 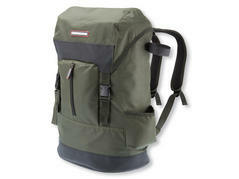 Extra big "De Luxe“ rucksack with a capacity of about 40 liters. Equipped with a 30-liters main compartment and a separated cooling compartment with integrated insulated fleece. 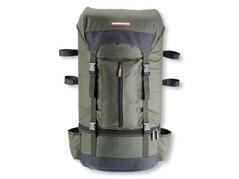 The extremely comfortable carrying system and the padded, breathable back part features this rucksack as well as both rod holders at each side and the big zipper pocket at the front. The lid is designed completely overlapping to improve splash water protection.